Patio Place provides Placentia with a wide selection of quality, brand name patio furniture, barbecues, fire pits, gas logs, patio umbrellas, bar stools, and more, all for the lowest prices in Orange County. We offer same-day delivery for most of our inventory with complimentary removal and disposal of your old patio furniture. We also custom-make protective covers; perform skilled, cost-saving repairs; and offer thorough patio furniture cleaning services. Additionally, we specialize in revitalizing patio furniture frames; replacing outdoor cushions, pillows, and slings; selling and installing common barbecue parts; and replacing umbrella covers, strings, and ribs. As a family owned company, we're committed to your complete satisfaction and offer honest, expert recommendations on everything we sell. Our doors opened in 1989 and over the years we have helped thousands of customers perfectly furnish their residential and commercial outdoor spaces in Placentia. With our experience and expertise, we are confident that we can help you find the solutions you need to fit your decor and budget. We're open seven days a week, and welcome any and all of your questions. Call or visit us today. We offer Placentia a wide selection of wicker, extruded aluminum, and cast aluminum patio furniture. Stylish, comfortable, durable, and fairly priced, our patio furniture is a great value. Our selection comes from the industry's best brands, including Sunset West, Patio Renaissance, Hanamint, Gensun, Alumont, and Telescope. Plus, with our our huge closeout inventory of patio furniture, including top-quality benches, chaise lounges, coffee tables, console tables, dining tables, end tables, granite tables, lounge chairs, lounge beds, sectionals, swings, and more, Placentia customers can save up to 50%. To learn more, call today. Patio Place sells fire pits and bar stools to those in Placentia from the names you trust most, including Hanamint, Alumont, OW Lee, and more, at the best prices in Orange County. 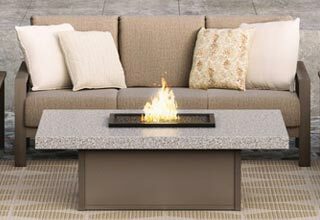 Our fire pits are available with or without a table and come in a wide range of models that vary in size, style, and material, including stone, metal and decorative tile. We also carry beautiful bar stools, which come with or without cushions, back rests, foot rests, decorative designs, swivel capability, and more. Visit our selection today to view our complete line of quality fire pits and bar stools for Placentia. In business since 1989, we've established long-standing relationships with Fire Magic and Real Fyre, and negotiate incredibly low prices on their selection of high-quality barbecues, grills, and gas logs, including direct vent system gas logs, vented gas logs, and vent-free gas logs. We offer convenient delivery and installation at your Placentia home or business, including gas line hook-up. We also can convert barbeques to and from propane or gas, and sell and install common barbeque grill parts. Our inventory includes barbeques of all shapes and sizes, as well as lights, warmers, range hoods, access doors, kegerators, sinks, faucets, fridges, and other equipment, for Placentia outdoor cooking enthusiasts. Call to learn more. 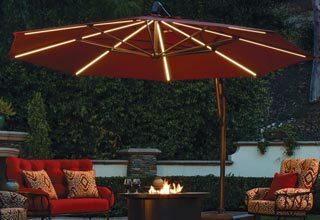 For great deals on brand name patio umbrellas, visit Patio Place today. We are an authorized dealer for Galtech, Treasure Garden, and NorthCape, and have over 25 years of experience selling and repairing quality umbrellas (click here to learn more about our umbrella repair services). We offer Placentia cantilever umbrellas, push-to-tilt umbrellas, side-post umbrellas, auto-tilt umbrellas, and easy-track umbrellas, as well as a number of umbrella accessories, such as bases, plug-in lights, solar-powered lights, and LED umbrella lights. We can also silkscreen your Placentia business name or logo onto patio umbrellas of any size. Whether your patio umbrella flew into your neighbor's yard or your patio furniture has become unsightly, Patio Place can help. 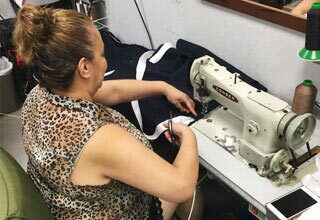 We have over 25 years of experience restringing and recovering umbrellas, replacing umbrella ribs, revitalizing outdoor furniture frames, and custom-making replacement outdoor cushions, pillows, slings, and straps for residential and commercial clients in Placentia. We always use quality parts and fabrics, such as our long-lasting, attractive fabrics from Sunbrella, Phifer, and original patio furniture manufacturers. We can recreate the original style of your umbrella covers, furniture cushions, and chaise lounge slings, or create a completely new look using one of our 600 available fabrics. 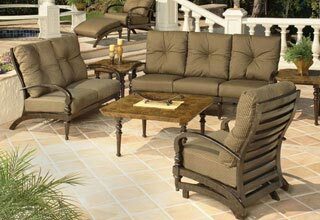 We can also custom-make replacement outdoor cushions according to your exact size, style, and shape preferences, and can also sew on zippers for ease of cleaning, or insert extra padding for added comfort. Call today to learn more about our affordable rates, fabric warranties, and quick turnaround.